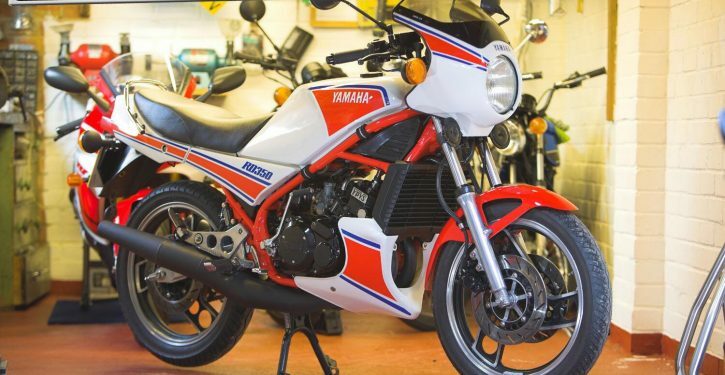 If there’s an evocative word that sums up a bike, generation or period of two-wheeled time that people of our age enjoyed, then ‘PowerValve’ is it. We know we bore you all silly here at CB-Net, trudging out the old phrase that ‘racing improves the breed’ but so it was (again) with the likes of the PowerValve. History shows that indeed it was Yamaha that was (once again) the first of the big factories to use this technology. 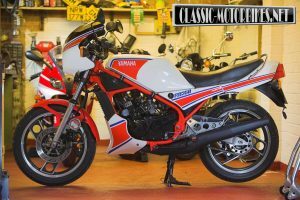 It was the 1977 500cc Grand Prix season that first saw their use: Yamaha’s OW-35K was the first race bike to incorporate the PowerValve system. The first win for a bike so equipped was the 1977 Finland 500cc GP, when Venezuelan Johnny Cecotto won ahead of the traditional swarm of Suzuki square-four RG500s…The following season – 1978 – saw the system’s first full season and the ‘PowerValve’ system helped take Kenny to the first of his three back-to-back world 500cc GP titles on the YZR500. Following on from use in both on and off-road competition, soon this technology would trickle down to road machines. While off-roaders would use a mechanically controlled version of YPVS – or Yamaha PowerValve System – both road-race machines road bikes would use an electronically-controlled system. 1980 and 1981’s Yamaha RD250 and 350LCs were a massive smash hit across the world and the ‘Yamaha PowerValve System’ would help take this machine onto even greater heights! For the 1983 RD350 ‘PowerValve’ an electric servo-driven system was used, similar to that used on the road-racing machines. So what were ‘PowerValves?’ Basically, these were electronically-controlled variable-height exhaust ports, which increased both power and engine torque. This effectively meant that you could finally have some torque in the mid-range without sacrificing that top-end two-stroke frenzied rush. The PowerValves were simply steel cylinders placed horizontally across the exhaust ports. These cylinders had cut-outs which would match the grooves of the exhaust ports. For high RPM use, the cut-outs matched exactly with the tops of the ports, giving maximum advance to the exhaust timing. At low RPM the valves rotated to block part of the exhaust port, in effect lowering them and retarding the exhaust timing. A bigger port on the RD350 would have just made the bike too peaky – so the variable port geometry was a refined solution to the problem. The acronym ‘YPVS’ would itself be famous, almost as famous as just telling your mates you owned a ‘PowerValve!’ The YPVS system ended up being seen on all of the RD/RZ family of bikes from 125cc up to the V4 RD500 as well as the YZ moto-crossers. As with most successful tech, it was soon copied. Honda came up with a number of different versions, including ATAC (Automatic Torque Amplification Chamber system) which worked with a butterfly valve located just before where the exhaust connected to the cylinder. At low RPM the valve was opened into a small chamber which increased the volume of the exhaust, boosting torque. At high RPM the ATAC valve closed and the exhaust gases flowed through the expansion chamber. This system was used on Honda’s off-road CRs, Grand Prix racing two-strokes and 1985 NS250R MC11 and NS400R triple road-going two-strokes. Honda’s V-TACS system added the ‘Variable’ acronym and worked only with a tuned expansion chamber which normally only worked well at the RPM it’s designed for, but at low RPM V-TACS boosted performance by opening a valve in the cylinder to increase manifold volume, cutting the power loss that occurred at low RPM with an expansion chamber. At mid RPM the valve was closed, allowing the expansion chambers to work as normal. V-TACS was found mainly on Honda’s small two-stroke bikes and scooters. The mighty Honda’s final version was the RC-Valve. The ‘Remote Control Valve’ worked similarly to Suzuki’s AETC system where electronics monitor engine RPM and opened and closed a two-blade exhaust valve controlled by a servo. This system was used on Honda’s later NSR250 family from the 1987 MC16-on. Suzuki used the similar AETC system (Automatic Exhaust Timing Control) with the VJ21 RGV250 (1989-1990) and moved to a three-blade system with the VJ22 250 L/M-model. With AETC, the PowerValve system was partially shut at low RPM. When shut it enabled the engine to make more power, but when it opened when the motor got to higher RPM more exhaust gases could flow out of the exhaust port. And of course there was the Kawasaki Integrated Powervalve System – or KIPS for short. KIPS altered port height to suit the various RPM settings and worked in conjunction with the CDI to ensure the best exhaust port dimensions and ignition timing. KIPS has been seen on everything from the KX off-roaders, learner-legal 1980s bikes such as the KMX125/AR125s to the KR-1/S race-rep 250s. Issues? Well, shut your eyes and listen to the chatter of a PowerValve as it goes through its ‘cleaning cycle’ when you switch the ignition on… remember? Now remember the servos jamming as carbon build-up led to them jamming! Still a great idea, though!